Kinetic Koffee roaster Kelly Brannon at the helm of Diedre, the Diedrich roaster. Photo by Matt Filar. I drank it anyway. It was terrible. You run no risk, in Arcata, of being subjected to this terrible not-Italian-bean coffee, as there are, miraculously, no nationally franchised coffee shops here. Instead, you will likely be offered fantastic locally-roasted coffees. Here’s what you need to know to be a coffee connoisseur. Coffee beans grow in the bean belt, which embraces the globe between the Tropic of Cancer and the Tropic of Capricorn, 23 degrees north and south, respectively, of the equator. For reference, Arcata is 40 degrees north of the equator. The southernmost tip of Italy is 37 degrees north. While coffee beans can be coaxed to grow at other latitudes, it’s cost-prohibitive to do so. Hence, there is no such thing as a locally-grown coffee bean, although with climate change, that probably won’t be true forever. All commercial roasters import their beans. Which, in fact, aren’t even beans at all. Coffee “beans” are actually the seed of the coffee plant. They grow inside a fruit, and so are actually a pit. There are many varietals, the most common being arabica, which most high-end roasters use, and robusta, which have twice the caffeine but half the flavor. Most cheap commercial coffees are robustas. Varietals of arabica are also named for their origin. Ethiopian, Mexican, Peru, Columbian, Sumatra, Indonesia, Java and Kona are all named for the places they are grown. Roasters either use a single-origin arabica bean or mix beans together in custom blends. There’s lots more to know about coffee beans – shade-grown, mountain-grown, wet-processed or dry-processed, hand-picked or strip-picked, organic or conventional, Fair Trade, Swiss Water decaffeinated, civet coffee (look it up) and so on. When coffee beans arrive at the roastery, they are green. Literally, green, in all shades, depending on their origin. Through vast amounts of experimentation, each roaster develops roasting profiles for each bean and each blend. 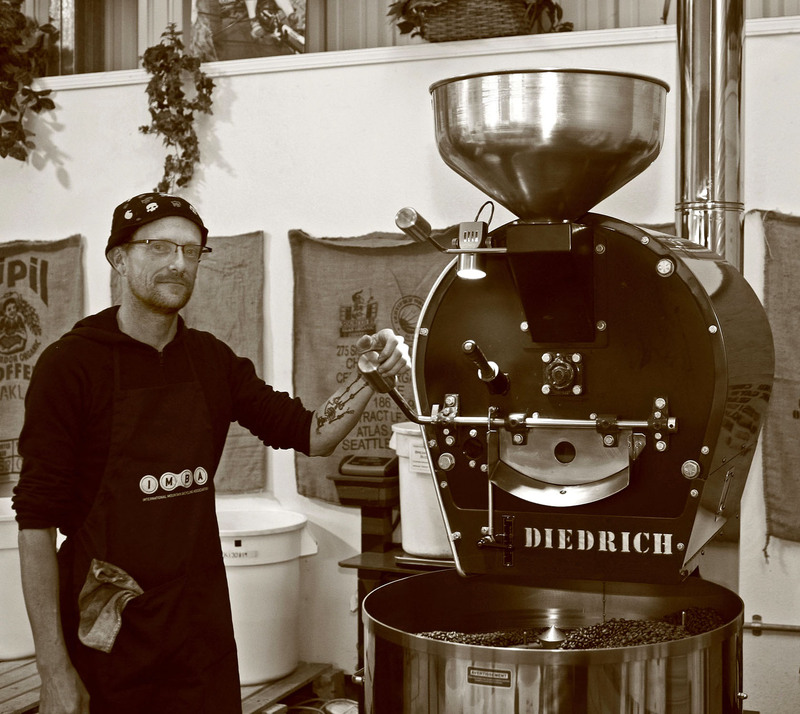 Most commercial roasteries use gas-powered drum roasters, and artisanal roasters use smaller machines than industrial roasters, producing up to 20 lbs. per roast. Artisanal roasters roast to order, which means they don’t roast the coffee until it has been ordered, and then deliver the freshly roasted coffee to the consumer within a day or two. Roasting coffee smells great. If ever you smell a terrible odor of burnt toast in your neighborhood, some roaster, somewhere, has failed to properly tend their roast. As beans roast, they darken into the brown beans you find in the store. The longer the roast, the darker the bean. As the beans roast, various things happen, but two of the most important are that caffeine diminishes and oils exude. A dark roasted bean, for example, has more oils and less caffeine than a blond roast, so during finals, you want to slam down the blond roast coffee. While each roastery’s roasts are unique, there are blanket terms to describe the roasts. A medium brown roast is typically called a “City Roast.” A “Vienna Roast” is darker and more oily. A “French Roast” even more so. And an “Italian Roast” even darker and greasier (here’s where Italy comes in). Most roasters don’t even talk about Vienna versus Italian; they are much more likely to discuss times and temperatures, first crack and second crack – geek talk. Once beans are roasted, they can be consumed as coffee. This usually requires grinding. Because grinding coffee breaks down the beans, ground coffee goes stale faster than whole bean. When buying coffee, check whether there is a roast date or grind date on the package. The more time has passed since roasting or grinding, the lesser the quality of the coffee. Beware undated coffees. Grinding coffee at home is the best way to have the freshest coffee every morning. There are a variety of grinds, each depending on the intended brewing method. A very coarse grind is recommended for the French press. Drip grind is for automatic coffee makers (e.g., Mr. Coffee). Espresso grind (aha!) is for espresso machines. Aeropresses require a finer grind, Turkish coffees, the finest grind, practically moon dust. How coffee is brewed is the final element in developing its flavor. Most people are familiar with drip coffee. This is the type of brewing used in offices, dorm rooms and convenience stores, where pots of coffee are left to burn for hours, creating a foul brew that many sadly deluded coffee-haters (and some even more deluded coffee-lovers) believe is what coffee is. A good coffee shop uses a drip grind, but with a very clean brewer that has no burner, keeping coffee fresh and hot in airpots. Most specialty coffee drinks available in coffee shops are espresso-based, made with a shot of espresso. Most people don’t have the equipment to brew espresso at home, although the advent of the Aeropress (check one out at aerobie.com) is changing that. Frothing milk at home still remains a challenge in the absence of expensive equipment. True coffee aficionados prefer pressing (such as with a French press or Aeropress) or pour-over methods. Pour-over coffee requires a dipper or funnel, and most baristas use a specialized kettle to control water flow. Check out Cafe Brio to experience pour-over coffee. Some restaurants use French presses, including 3 Foods Cafe, for example, who will bring a tiny French press to your table when you order coffee. If you want a sample of how coffee is served in the Middle East, visit Izzy at the Pita Grill (soon to be located in the parking lot of Pacific Outfitters at Seventh and G streets) and ask him for some Turkish coffee. Here’s the simplest way to make great coffee at home: Get a French press (a.k.a. Bodum). With the money you save from never having to buy filters, invest in a small grinder. Buy some premium coffee beans. Coarsely grind the beans, just a couple of whirls in the grinder, and put them in the French press. Boil some filtered water and fill up the press. Stir. Wait exactly four minutes. Press, pour and enjoy. As you sample the great coffees roasted locally, to experience their true flavors, try them without creamers or sugar. You might be surprised how an excellent coffee requires no doctoring to deliver a smooth, satisfying shot of pure pleasure. Kelly Brannon is a coffee-powered drummer and the roaster at Kinetic Koffee, an artisanal roastery in Arcata. You can sample the beans of his labor at Coffee Break, Couple Cups, Los Bagels at the Farmers’ Market, and Murphy’s delis, as well as at the finest eateries in Arcata. Arcata Eye Arts Scrutinizer Lauraine Leblanc assisted with this article. This entry was posted on Friday, September 6th, 2013 at 5:53 pm	and is filed under Opinion. You can follow any responses to this entry through the RSS 2.0 feed.